Apple builds it right into their tagline, Think Different. The quickest, surefire way to keep the innovator within from coming out is to get stuck in your routines. We all have them. Routines keep us going, they create our comfort zones, they make us get things done. But routines are dangerous, especially if you ever really want to change anything. When we develop a routine, either as individuals or as an organization, we are limiting our experiences. We are creating an environment where things that are new and different have no place. We feel comfortable the more we practice this routine, and are therefore less likely to step back and challenge ourselves. Here is an idea, break the routine. I am not saying get rid of it altogether, just change it up from time to time. Do things in the wrong order. Wake up 20 minutes earlier. Go for a walk. Forget about your email for a day. Though all of these things may be quite trivial, they will at least get you out of your comfort zone and thinking about things differently. That is the first step to creating real positive change. Whenever you find that you are sleep walking through whatever it is that you are doing, wake yourself up. Step outside your comfort zone and see how things change. Don’t make it easy on yourself, because all you are doing is creating limitations. 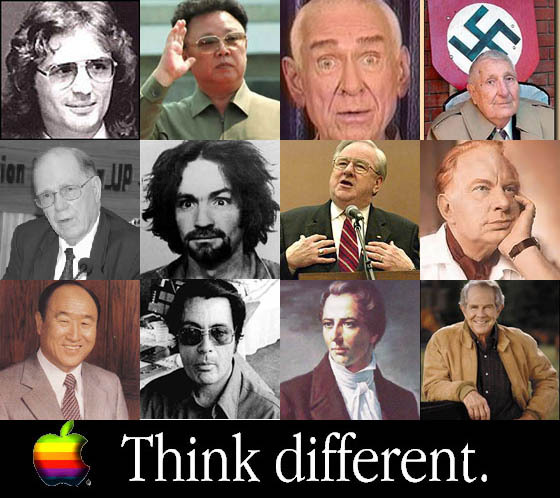 Challenge yourself to do as Apple says and Think Different. This entry was posted on Monday, August 4th, 2008 at 11:37 pm and is filed under Theory. You can follow any responses to this entry through the RSS 2.0 feed. You can leave a response, or trackback from your own site.